This heifer is going to be a great cow. Her pedigree is loaded with quality Bob Loomis breeeding including Cowboy Up Chex, BL Rio Cachit, and BL Mazue 4. On the bottom she has Phenomenon, Phenominal Abilgail,and Starlight. Her sire, Eight Seconds Chex, is an over 81" brindle, and her dam measures 76" TTT of twisty horn. She is already making her first twist. She is bred for horn and beauty, and she is already a traffic stopper. This heifer is the second heifer out of a wonderful cross of RJF Sittin Dreamer x WS Overboard. She has a wonderful flat lateral twist that is now over 60" TTT at only 26 months. This young heifer has a pedigree built for horn. Take a close look at the bottom side and you will see nothing but historic horn production. The top side only has Sittin Bull, HCR, and CC Sheeza Whip Er Will. 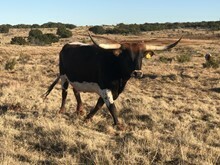 This calf's dam had 80" of total horn at three years. She will be lightening in a bag! Vixen is a beautiful red calf with abundant markings to make her standout in a pasture. Her pedigree includes Tempter, ECR Eternal Tari, Field of Pearls, Don Julio, Hunt's Command Respect, and Samson 26. Horn genetics are strong and proven. Her dam, BG Temptress has flot lateral horns measuring over 50" at two. This price won't last as the horns kick in. Don't pass over this pedigree loaded with famous producers: Tempter, ECR Eternal Tari 206, Field of Pearls, Maximus ST, Horsehead Showtime, Eternally Tari, LLL Maximillion, Sittin Bull, CC Sheza Wip Er Wil,and Hunt's Command Respect. She will make a great outcross to JP Rio, Casanova, or any of the Loomis line. Beautiful all black bull with horns growing straight back. Part of our embryo transfer program with powerhouse pedigree utilizing Hubbell's 20 Gauge and RC Pacific Mermaid. Full or half interest available. Half interest at $7,500. Possession negotiable. 2 90" ancestors. Her dam started out red and white and is now black and white. 3 brindles in her pedigree. We expect her to brindle soon. She counts Cowboy Tuff Chex, Tuff's' Ruff N Rowdy, and BL Rio Catchit on the top. ZD Rockin Ginger and Eight Seconds Chex on the bottom side. This calf has great horn potential, and when she starts to grow this price will move up as her horns move out. She is from a slow growth line, but her grand dam was over 76", her grand sire is over 80", and her sire is over 80" counting the 4" he broke off. Give her time and she will reward you. Double bred FL Rio Maxine with Cowboy Tuff Chex and CV Cowboy Casanova. He is brindle and gorgeous. High Roller was steered in 2018. This is another RC Pacific Mermaid heifer from our ET program. She is a beautiful girl with promising horn buds that hold the promise of becoming another fantastic Mermaid daughter. Mermaid has already produced 3 over 90" offspring with several others in the 80s. Mermaid is the most consistent producer of horn we have ever seen. This heifer goes back to Cowboy Tuff, BL Rio Catchit, FL Rio Maxine, and WS Overboard. Overboard has been a great produced on our ranch as can easily be seen by a glance at Swill Miss' dam, Dreaming of White Chocolate. Chocolate is likely headed into the 80's as she was over 68' TTT at 3 years old. No reason to think this heifer won't out do her mom in a few years. This beautiful solid black heifer has 8 over 80" ancestors and 2 over 90". Her pedigree is full of famous sires and dams. Take a long look, and you will see major potential in this beautiful baby. His sire is an HSC Champion out of Cowboy Tuff Chex and his dam is a 76" daughter of Fantom Chex. He should roan up over time. Very curious little guy as he explores the world.